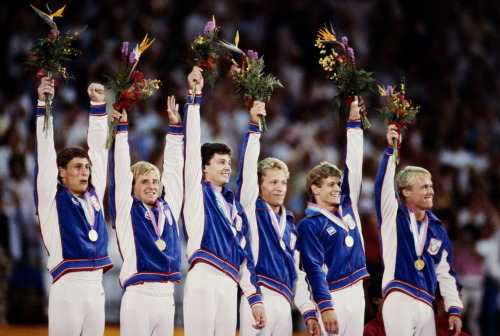 Until 1984, the USA men’s gymnastics team had never won team gold at an Olympics. That breakthrough in Los Angeles was due to the efforts of team members Bart Conner, Timothy Daggett, Mitchell Gaylord, James Hartung, Scott Johnson and Peter Vidmar. Vidmar in particular shined, also garnering a gold in the pommel horse and a silver in the Individual all-around. Vidmar is a popular motivational speaker and talks often about how he learned a lesson in Budapest, Hungary, about the importance of not only taking risk, but committing to taking risk. Those who do, often end up champions. But Vidmar, like many champions, learned this lesson the hard way. By falling. Concerned that he was not able to execute the moves during his warm up just prior to the finals, Vidmar allowed fear and indecision to creep in. He talked to his coach, who gave him straightforward advice on technique, but Vidmar was not feeling confident. He decided to drop the maneuver and forgo the potential 0.2 points. “Why not? I’d lose the two-tenths of a point for risk, but I could still score as high as a 9.8. That would put me on the winner’s rostrum for sure. That would mean a medal, maybe even a silver.” But he also realized just as quickly that dropping the move would mean losing the World Championship. After all, champions go for it, and someone else would. This was the mental state of Vidmar as he stepped up to the horizontal bar and started his routine. And after his back flip with half-turn in the pike position he reached for the bar. And as Vidmar says, “the bar was not there.” He fell three meters to the floor, face down in the mat. He got back up, finished the routine, and ended up eighth of eight. As his coach, Sakamoto tells it, Vidmar was not a happy camper. During the medal presentation, I innocently asked, “Pete, what happened?” “What happened?” Peter responded, face red with abject disappointment. “I’ll tell you what happened!” he continued angrily. “I reached out to catch the bar, but the bar wasn’t there. That’s it!” He picked up his bag and stormed out of the arena in a fit of rage. I had never seen Peter behave this way. And the rest is history. Vidmar worked on that routine, overcoming fear and doubt, and stuck a perfect 10 in the horizontal bars en route to a silver medal in the All Arounds at the Los Angeles Games. 31 JUL 1984: THE UNITED STATES TEAM CELEBRATE AFTER RECEIVING THEIR GOLD MEDALS FOR THEIR VICTORY IN THE MENS TEAM GYMNASTICS COMPETITION AT THE 1984 LOS ANGELES OLYMPICS. THE USA TEAM COMPRISES PETER VIDMAR, BART CONNER, MITCHELL GAYLORD, TIMOTHY DAGGETT, JAMES HARTUNG AND SCOTT JOHNSON. Posted in Gymnastics, Other Olympics and tagged Bart Connor, Budapest, faceplant, horizontal bar, James Hartung, Makoto Sakamoto, Mitch Gaylord, Peter Vidmar, Scott Johnson, Timothy Daggett, World Championships. Bookmark the permalink.